from the other team and start the break gaining another possession for the offense. Possessions are the vital statistic. They lead to shots, that lead to shots on goal and effective SOG are goals. If you out possess, out shoot, out SOG and out score the other team every game, you go undefeated. To do that you not only have to play great in goal and team defense (winning teams' goalies have save percentages in the 60s% and losing ones in the 40s%) but it is essential that once you get the ball that the team gets the ball into the offensive end. Since most clears are not set clears off a restart (after a foul or out of bounds) but are off of changes in possession without a stoppage in play (save, ground ball, pickoff) then how the ball gets cleared is mostly dependant on goalies throwing and the defensive squad catching. D2 goes to goal line extended and calls the keeper's name (repeatedly) and D1 covers in front of the goal (until the 1st pass is completed, then he goes up field as the top swing man - goalie is the back swing man and not in line with the goal). If D3's attackman is riding him, watch his head. If he is watching D3 throw to D3's over-the-shoulder stick. If he is watching the goalie, then the goalie waits or looks up the middle. If D3 sees that the riding attack is watching the keeper, then D3 back-doors the attackman to an open area toward the middle of the field with his stick over the other shoulder and goalie throws to an open D3. If D3 is too well covered, the goalie looks to the breaking M1 and M2 using the same rules. Important: the pass has to seem long with some arch so that it can't be knocked down and the clearing player can RUN under it, like a long touchdown pass. If they are covered the goalie looks to M2 using the same rules (arching pass, but still with some pace, to the over-the-shoulder stick position of M1 ). Practice throwing the ball 40-50 yards, with good pace and a arch that gets the ball over the other teams players who are between you and your breakout teammates. Make the up field pass nearly right away to the waiting middie or attackman. 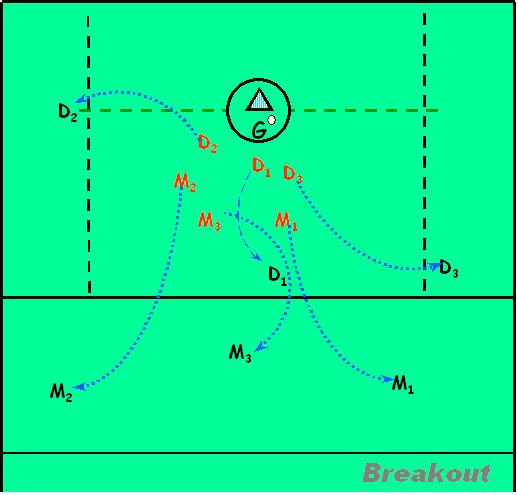 Coaches Responsibilities - At every school I have coached at for the last 10 years we ran a drill with a goalie three defensemen, three defensive middies and three riders (on D3, M1 and M3) where the coach shoots the ball to the keeper, keeper yells 'CLEAR' and the breakout proceeds according to the diagram. The clearing team has to get the ball across midfield in 3-4 passes and then pass it back in 3-4 passes to the coach. Every catch for the defensive team should be over-the-shoulder. Then swap out all the defense and clearing middies and riding players for the next unit and run it again. Swap goalies every five or every one if you like. On our teams if the clearing players did not use over-the-shoulder stick position and catch then that whole unit did 5 pushups - that gets 'em learning. If the goalie throws a flat pass - 5 pushups for that group. There is no reason that a team can't run the breakout with zero turnovers, except if they don't practice it until they are really good at the basic catch, throw, position and timing. So it is a coaches responsibility to practice breakouts assuring that the keeper is comfortable with all his players and getting the over-the-shoulder pass completed every time.to an up field breakout player.